We’re impressed by the ARM prototyping board which [Danjovic] is showing off. He proves that in this day of ever shrinking packages it’s still possible to make your own development tools with protoboard and a soldering iron. To tell you the truth, if he had designed and etched his own board we probably wouldn’t have featured it. But he didn’t need to spend time on the layout, etching, and reflow. Instead it’s just some enamel wire and a lot of patience. The patience is because the NXP ARM Cortex-M0 chip comes in a HVQFN package. We’re not entirely sure about the HV part (the package alphabet was not entirely clear on this) but QFN means Quad Flat No-Lead. That means no legs on the chip. So [Danjovic] glued it upside down and soldered point-to-point to break out all of the pins. The top side of the board has a bootloader button, reset button, power regulation, and a crystal oscillator. He doesn’t mention what bootloader he’s using, but a Nokia USB cable gives him the connectivity to push his programs onto the chip. Reminds me of Elm-chan’s style. If you’ve never seen it, you should. Heh, that was the first thing I thought when i saw this. wow. that’s dedication! most impressive! well done,should see dev boards become really cheap! What would it take to build a bot that could automate that ask? This is very impressive solder work, but I hate to state the obvious: why didn’t he just buy, get a free, development board? They are EVERYWHERE. I have made so many prototypes from dev boards. Often, the first thing I do is to de-solder all the stuff I don’t need on it other than the uC. HVQFN – Heatsink Very flat Quad Flatpack No-leads. Wikipedia’s your friend, after all. Could be found on the NXP website, too, but not as fast. I guess editing’s not what it used to be. Like looking up stuff instead of saying “I dunno what’s going on. Look, I’ma scientist”. Bummer. This is a nice work of art. I’ve seen more complicated, but it is definitively done well considering the used materials. But it’s b*s anyways. 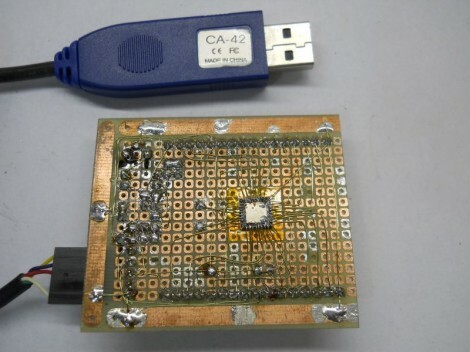 This is a chip that’ll run at several MHz. The external oscillator even has 14MHz. Connecting it far away by flying wires is like the last thing you want to do when connecting a HF source to a clock input. Seriously. 14 MHz is by no means HF. Especially not, if the leads are only an inch long. Soldering onto the middle pad shouldn’t pose a great risk, unless you decide to heat it for several minutes on end. After all, there are thermal barriers in the shape of the Si-die as well as the epoxy attach. Best regards from someone who used to put silicon in QFNs for a living. lol, if 14MHz is high frequency, what are those old pentium 4GHz ICs? He used .19mm wire.that’s between 32 and 33 awg.They have wire that has insulation that will melt off with a soldering iron. I can do the larger sizes easy. for the smaller you can bend every other pin up to make them easier. It would be great to have a hand tool to make this easier. This is a QFN. The N stands for no-lead. It basically means no pins. Just flat soldering surfaces. Bending pins would work on a QFP (quad flat pack). NXP has M0 in DIP28 now. You can just plug the DIP28 in a breadboard, easiest for prototyping!